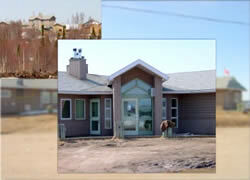 The Webequie First Nation Nursing Station is one of the most modern nursing facilities in the north. The Nursing Station is usually operated with three nurses, a Community Health Representative (CHR), and two full-time counsellors. The aboriginal staff also serve as interpreters and assistants. The Nursing Station is usually busy, so appointments for non-urgent matters must often be made several days in advance. The nurses that operate and manage the Nursing Station are veteran health professionals with sound knowledge of community health, trauma management, etc. Nurses serving isolated northern communities often assume the role of doctors, and are classified as Nurse Practitioners. Nurse Practitioners are authorized to perform many services usually performed by a doctor. These Nurse Practioners have 24 hour consultation access to doctors in Siuox Lokout. These consultations are usually required if a patient is suffering from acute infections or serious injuries. Nurses are on call for 24 hours a day to handle emergencies. If a patient is considered to be in critical condition, an air ambulance is dispatched to Webequie to transport the patient out of the community to receive treatment. Patients are usually transported to a hospital in Sioux Lookout, Thunder Bay or Winnipeg. A doctor visits the community twice a month, and it is necessary to make an appointment in advance. Patients are seen chronologically, however acute patients take priority. Other health care professionals, such as dentists and optometrists also visit the community, although infrequently. The Nursing Station also houses the mental health workers. Appointments are booked by phoning one of the workers. The newest addition to services delivered is the Healthy Baby and Healthy Childern Program. This program helps first-time parents, parents in general and their families. The program consists of education in parenting, nutrition, and other health conditions relating to families.